Choosing to use laminate floors in your home can give a beautiful finish to a room. 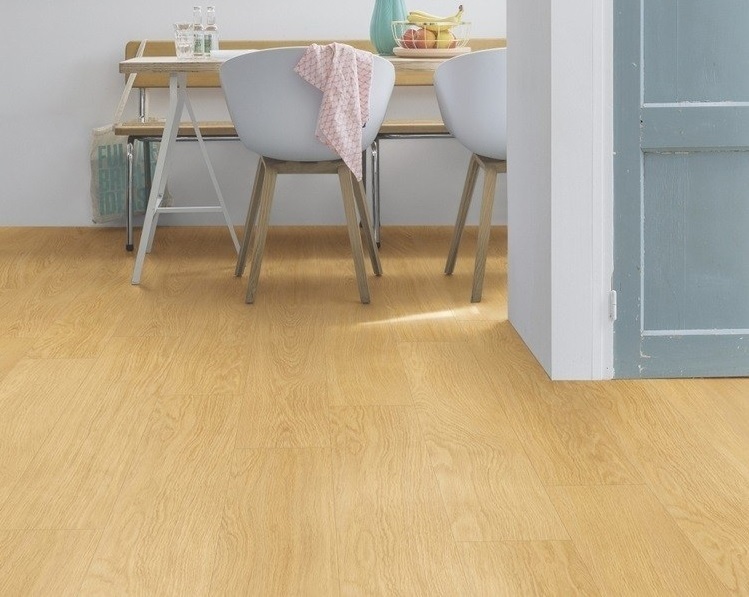 With many benefits such as their resistance to scratches, spills and the occasional muddy boots, laminate remains a popular choice among homeowners. Compared to carpets laminate floors also produce less dust, which is a relief for those who suffer from allergies. Laminate floorboards can also give the look of stone or wood, without the hassle of oiling, sanding or high material cost. To laminate your floors we recommend following our simple 4 step process to lay laminate floorboards without a headache. To prepare to lay down laminate flooring, start off by measuring the room. Take 2 measurements of the room. One length and the other width. Multiply these two together to get the square footage. To get a rough idea of the number of boards you will need, you can take the number of width of the boards and divide it by the width of the room. This will give you a rough idea of the number of boards you will need. In preparation of laying new laminate flooring, it is recommended that you remove your existing flooring first. A floor bully is a perfect tool for removing the old floor tiles as well as vinyl floorboards. Clean the room of any debris with a brush and remove all furniture. Finally, lay the underlay to finish preparation stage. Once the underlay has been fitted, you can begin laying the first row of boards. To do this, place a packer against the wall and the first laminate floorboard. A packer will allow the floorboards to adjust to any temperature changes by either contracting or expanding. Failure to add a packer may mean that your floorboards may have fractures, abnormal gaps or buckling when there are temperature changes. You will need to cut the tongue from the floorboard to ensure that it can be pushed against the packer smoothly. You can cut the tongue using a table saw or handheld saw. After the first row of floorboards have been laid continue to lay floorboards until the floor of the room is completed. For finishing touches, you may decide to add edging trims. Edging trims give a seamless look to the room whilst hiding the packers that were installed earlier. Choosing a self-adhesive edging trim will make it easier to install and cleaner because there is no glue to apply to the wall and the edging trim. This can also speed the amount of time it takes to apply the edging trim. To apply edging trims to corners, you will need a trim cutter to cut the trim at a 45-degree angle. Once you have applied the edging trim you have finished! You can enjoy laminate flooring for years to come since they are hardwearing and easy to clean. Frank Key offers a wide range of laminate floorboards and installation accessories to help you create your dream home. To find your nearest stockist for flooring click here.